Today's Washington Post front page included an article about a listing in Washington, D.C. that received 168 bids and accurately described the market there as "red-hot". The Post went on to note that the median home sale price in the District is up 14 percent from last year. Definitely a good sign...and there is another fact about DC that might be even more surprising: At $435,000, the YTD median sale price for 2012 is the highest on record! The District is not alone, neighboring Arlington ($510,000) and Alexandria ($455,000) are also at peak pricing levels this year. While a recent Wall Street Journal article correctly explained that national housing prices finally hit bottom in 2012, prices in several DC Metro counties actually bottomed out back in 2009 and have been gaining ever since. 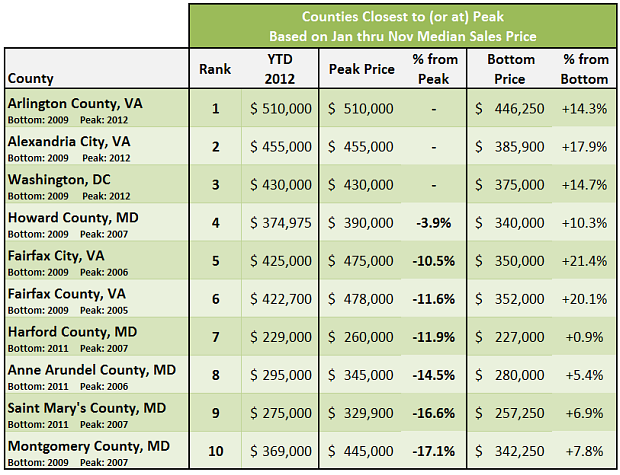 To further the conversation, here is a chart of the Top 10 counties in the MRIS area, ranked by how close they are to their Peak Price. It is based on the aggregate median sale price from January thru November. The right-most column displays the appreciation from post-bubble "bottom", Fairfax homeowners that bought in 2009 should be smiling. Let's hope that the Fiscal Cliff is avoided so that the local economy continues to improve in 2013! The Wall Street Journal posted an article in their Developments blog outlining the fact that national home prices finally hit a bottom in 2012, and that next year will be the first time since 2006 where prices ended the previous year in positive territory. Optimism is taking hold in markets across the country, and the fact that more potential buyers finally have a sense of urgency (as noted in the WSJ post), resulted in the author being optimistic that more sellers may be encouraged to put their homes on the market in 2013. Activity in the Baltimore Metro housing market remains steady, up slightly from last year, but the rate of year-over-year growth is slower than earlier in the year for many indicators. Historically sales decline between October and November, but the uptick in new contract activity last month led to a rise in sales in November. Year-over-year growth in new contracts remains, but is down considerably across all property segments this month, which could be an indication of cooling market demand. Condos continue to increase market share, reaching their highest proportion of sales on record in November.